Founded in 1954, The Kentucky Lions Eye Foundation (KLEF) is a charitable non-profit organization whose mission is to prevent and cure blindness by supporting research, and operating eye clinics and eye banks. The foundation’s activities are supported through funds contributed by Lions & Lioness Clubs, individual members, businesses, benefactors, memorials and bequests. Eye clinics are available to any Kentuckian through direct referral by any Kentucky Lions Club. The clinics are located in Louisville, Lexington, Bowling Green and Ashland, and primarily serve indigent patients or those who do not have adequate local facilities for eye care. KidSight is a “kids only” program that utilizes camera screening equipment throughout Kentucky to find children with eye conditions including amblyopia (lazy eye) and poor vision. After diagnoses, parents are provided a packet of information that contains information on where to go for additional vision care. Kentucky State Fair Screenings provide thousands of adults and children with free photo screenings each year. The Vision Van allows the Foundation to take vision screening on the road. Screenings are free of charge and available to people of all ages. Each year, approximately 6,000 people from all over Kentucky are screened with the Vision Van and referred to local doctors for treatment. Kentucky State Fair screening provide thousands of adults and children with free photo screenings each year. Common eye conditions such as cataract, macular degeneration, squint and amblyopia (lazy eye) are screened, as well as the need for corrective lenses. Through its fundraising efforts, the KLEF has supported eye research for more than 60 years. In 1968, the Lions raised $2.2 million to build the Kentucky Lions Eye Research Institute. In 1985, $1 million was raised to endow a University of Louisville Ophthalmology research chair. 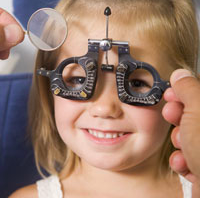 $350,000 was raised in 1999 to start the Children’s Eye Clinic at the Kentucky Lions Eye Center. The list of accomplishments by the KLEF continues to grow each year. The KLEF’s Halloran Fund is a trust that provides funds to assist the legally blind in Jefferson County, KY, and neighboring counties. A KLEF committee reviews and approves requests for assistance, which range from scholarships, house repairs, utilities, medical care and more.